It's clear why the Parasol Unit gallery is so excited to host this major solo retrospective of Katy Moran's painting: she is a major talent, exemplary of the best art being made in London right now. Moran betrays no hints as to where she might turn, constantly pushing boundaries and taking risks. This certainly makes for an extraordinary adventure, as she opens up space for new things to happen. There's a liberating pluralism in the vocabulary of her abstract canvases, generated from figurative elements, shot through with energy, and teeming with youthful exuberance. Keen eyes may indeed gain pleasure in attempting to pick apart Moran's sources and influences. All of life is here: the highly textural quality of a moment is summoned up in impressions of colours and arrangements, evoking walks in the city and even autobiography. She explores pregnancy, a subject rarely considered in contemporary art. Clown Navigation deals with the psychology and physiology of supporting a human life. The Main Event conveys the lead up to the event of childbirth itself – the inner journey towards physical birth is visualised as passage through a body/landscape. The Judges communicates an awareness of her firstborn's watchfulness, as she attends his newly-born sibling. The direct nature of the painting, along with its interior/exterior quality, means Moran can explore emotional complexity and layered experiences. Humour and fun, too, are evident in Moran's wonderfully rambunctious titles, while seriousness and sincerity also shine through. Eschewing a larger scale in favour of an intimate and authentic quality, Moran lends her hand to small, dense works. Early layers often peek out from her finished pieces, from which different directions can be glimpsed, endowing an air of purposeful potentiality. 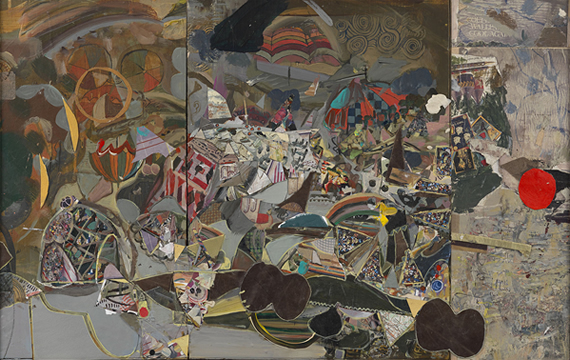 Later works incorporate collage, introducing more elements of more chance, and rendering the process dynamic in a manner akin to Matisse. By rotating the canvas while making a painting, Moran alienates her images from herself. 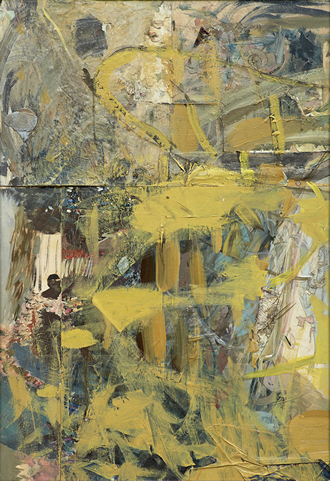 Then, by allowing the canvas to rest and sporadically making it strange again, she is compelled to interrogate its structure, and the expressive marks of the paint. In this way, an incredible force is lent to the collection. This technique is used to spectacular effect in the carnival inspired Home Coming, along with its vivid inflection of colours. The work is chronologically displayed. So, while circulating through the gallery you form your own constellations, free to alight and return as details and clues emerge and illuminate, the paintings becoming portrait-like. Crucially, Katy Moran offers many places for the language of painting to go and grow into, which is why the public and painters alike will continue to return to her for years to come.